The Cancel Subscription step will cancel a subscription that was started during a form submission. Subscription ID Field: Select the field containing the ID of the subscription that will be cancelled. Select "Entry Subscription ID" to cancel the subscription created for the current entry. If you'd like to cancel a subscription created in a different entry then select the field which will contain the ID of the subscription you want to cancel. The dropdown will show all Hidden fields, Text fields and Subscription ID fields that are on the form. See the link below for an explanation of the Subscription ID field. Cancellation: Select when to cancel the subscription. The available options are "cancel immediately" which will cancel the subscription at the time the step runs and "Cancel at the end of the billing period". 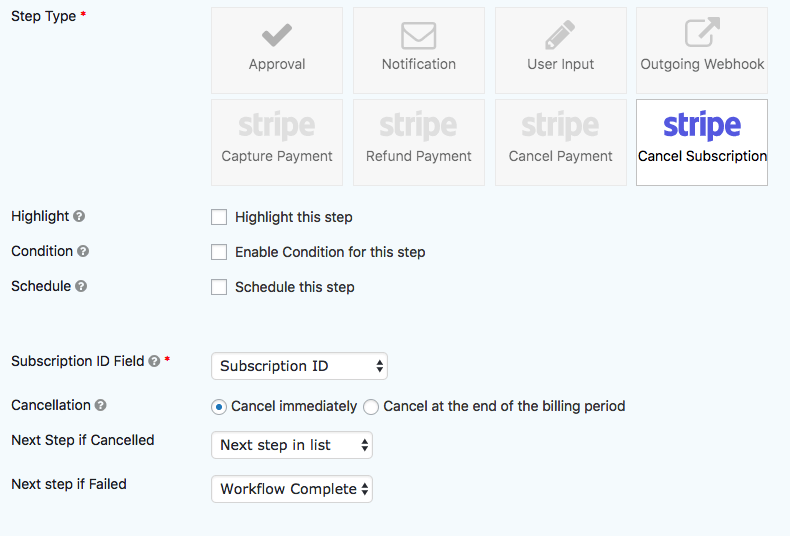 Next Step if Cancelled: Select the next step in the workflow if the payment was cancelled successfully. For example, you could select a notification step and send emails to the customer and an administrator informing them that the payment was cancelled successfully. Next Step if Failed: Select the next step in the workflow if the payment was not cancelled successfully. The most likely scenario for this is that the API returns an error. For example, you could select a notification step and send emails to an administrator informing them that the subscription was not cancelled successfully. The Gravity Flow Strip Extension adds two new settings to the Gravity Forms Stripe Add-On Feed Settings. 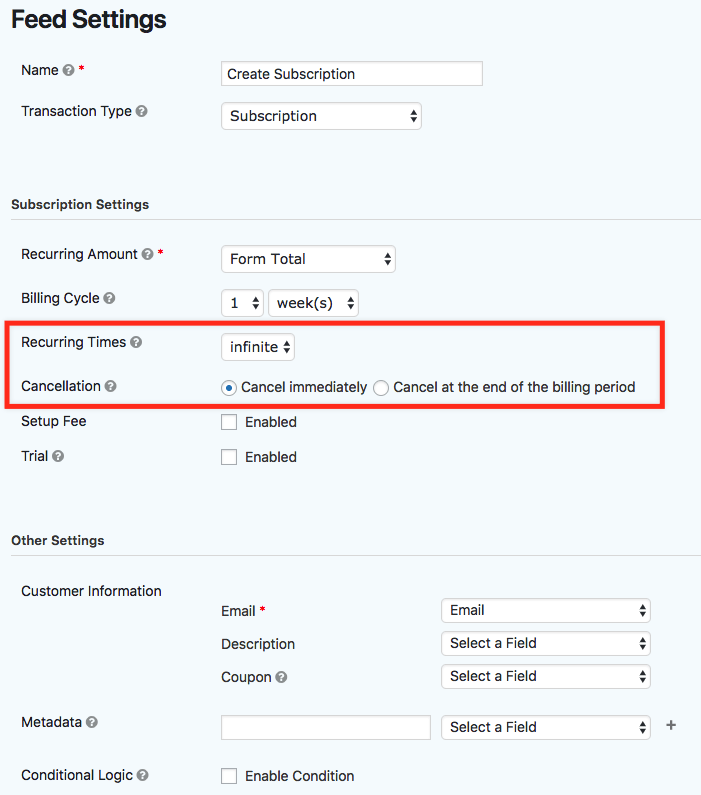 Recurring Times: Set the number of times the subscription should repeat. Cancellation: Select when to cancel the subscription. The available options are "cancel immediately" which will cancel the subscription at the time the feed runs and "Cancel at the end of the billing period".